We believe that the same AI technology that gives big tech companies a competitive edge should be available to developers or businesses of any size or budget. That’s why we built our new Custom Training and Visual Search products – to make it easy, quick, and inexpensive for developers and businesses to innovate with AI, go to market faster, and build better user experiences. We’re excited to announce two new products that will empower developers and businesses everywhere to personalize AI to fit their specific needs and build AI into their workflows and apps. Custom Training allows you to build a Custom Model where you can “teach” AI to understand any concept, whether it’s a logo, product, aesthetic, or Pokemon. Visual Search lets you use these new Custom Models, in conjunction with our existing pre-built models (general, color, food, wedding, travel, NSFW), to browse or search through all your media assets using keyword tags and/or visual similarity. Read on to get the full rundown of our new products or go straight to our docs for more information. Read on to get the full rundown of our new products, or go straight to our docs for more information! Custom Training allows you to quickly and easily “teach” our visual recognition technology to understand any new concept relevant to you or your business. New concepts can be trained with high accuracy orders of magnitude faster than before, requiring less than ten images per concept as compared to the thousands of images per concept traditional AI training required. And, with each new image example, the AI will get smarter and better at recognizing your concept! Visual Search allows any user to easily organize, access, or recommend their images or products by keyword or visual similarity. Perform powerful searches across your own collection of images using our pre-built models or your own custom model. You can also build our Visual Search capability into your website, allowing a drag-and-drop search by image and/or tag, or enabling better real-time image-based recommendations. With our two new products, you’ll also have access to a brand new UI if you like looking at images as images instead of code. You can use this UI to get a quick view of your image collections, train or search your images without writing code, and check in on what people are posting to your site. Lastly, with all these new products comes a brand new way to interact with our API. 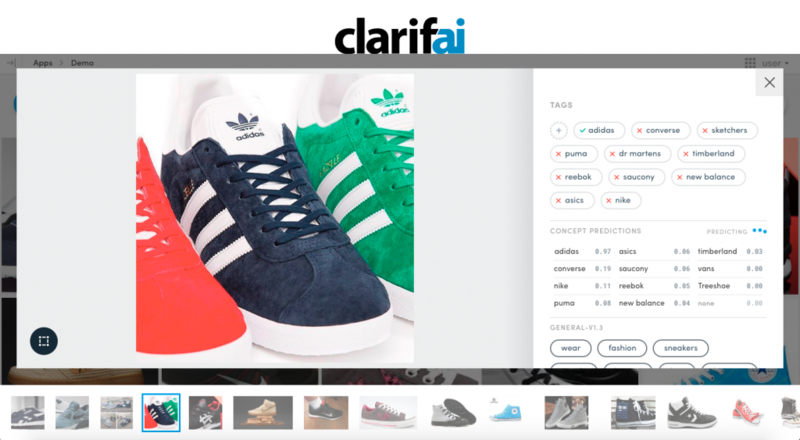 You can now replace your image database with Clarifai – it works with either URLs or image bytes! We’re gifting customers with 50,000 free API credits to try and test our new products. Pretty nifty, huh? This is the perfect time for you to explore our new products and see if you like them without having to pay a cent – sign up now! I WANT FREE API CREDITS!